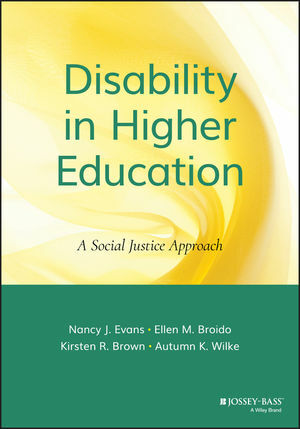 Disability in Higher Education: A Social Justice Approach examines how disability is conceptualized in higher education and ways in which students, faculty, and staff with disabilities are viewed and served on college campuses. Drawing on multiple theoretical frameworks, research, and experience creating inclusive campuses, this text offers a new framework for understanding disability using a social justice lens. Many institutions focus solely on legal access and accommodation, enabling a system of exclusion and oppression. However, using principles of universal design, social justice, and other inclusive practices, campus environments can be transformed into more inclusive and equitable settings for all constituents. The authors consider the experiences of students, faculty, and staff with disabilities and offer strategies for addressing ableism within a variety of settings, including classrooms, residence halls, admissions and orientation, student organizations, career development, and counseling. They also expand traditional student affairs understandings of disability issues by including chapters on technology, law, theory, and disability services. Using social justice principles, the discussion spans the entire college experience of individuals with disabilities, and avoids any single-issue focus such as physical accessibility or classroom accommodations. Understand how disability interacts with multiple aspects of identity and experience. Despite their best intentions, college personnel frequently approach disability from the singular perspective of access to the exclusion of other important issues. This book provides strategies for addressing ableism in the assumptions, policies and practices, organizational structures, attitudes, and physical structures of higher education. NANCY J. EVANS is a professor in the School of Education and former coordinator of the master's program in student affairs at Iowa State University. She is the coauthor of Student Development in College, Second Edition and Foundations of Student Affairs Practice, both from Jossey-Bass. ELLEN M. BROIDO is an associate professor of higher education and student affairs at Bowling Green State University in Ohio. KIRSTEN R. BROWN is a student affairs professional at the University of Wisconsin-Madison and a part-time faculty member at Madison College. AUTUMN K. WILKE is assistant dean of disability resources at Grinnell College, in Iowa.